Our creative team have worked wonders and given us a fantastic Christmas makeover! The lovely people at coolsmartphone have already written about our makeover here. What do you think? Tell us @localM8 (#festivem8) and on Facebook! Celebrating the beginning of the festive season, recently launched M8, your local mate in the UK mobile app – available on iPhone, Android and BlackBerry Touch devices – has undergone a festive design makeover to enrich the journey for consumers using the app as they shop, socialise and travel throughout the UK over what is known as being one of the busiest times of the year. 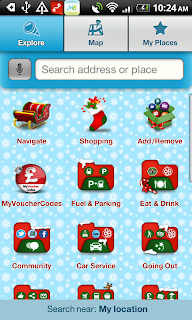 With a homescreen that now features all of Britain’s favourite festive icons including Santa’s sleigh, Rudolph the red-nosed reindeer, beautifully wrapped gifts, brightly coloured stockings and Christmas tree baubles – all with a generous decoration of seasonal snow – the most recent update to mobile application M8 has been designed to add extra Christmas cheer to its existing location based navigation, local information and social media features. “We’re really happy with M8’s Christmas theme. Aiming to add a little festive cheer to our M8 community’s experience, we believe our team has come up with a fantastic and creative visual experience that enhances the in app journey with a bit of fun. Everyone loves Christmas – even the stressful times – so we’ve designed this update as a simple way to join in the fun,” said Tim Owen, UK Country Manager for Telmap, developers of M8. Revealing the new creative design on the same day as developers – Telmap – update the mobile app to enable smartphone owners to browse and search relevant local deals that are active on leading discount code website MyVoucherCodes, M8 aims to provide the most comprehensive mobile app on the market in terms of offering up-to-date and relevant local content alongside advanced navigation this Christmas. With this latest multiplatform version of M8, Your Local Mate in the UK offering an enhanced mobile experience, the mobile application is available to download on iPhone, Android, and BlackBerry Touch devices, and has been designed and developed by Telmap, an Intel company and a world leading location- based services provider. “As a token free stocking filler gift to all of our valued community, we hope everyone enjoys the theme and we’re really looking forward to getting people’s reaction to our Christmas-sy M8 as they prepare for the holidays,” added Owen. Just in case you need reminding, M8, your local mate in the UK is free to download for iPhone, Android and BlackBerry touch devices from the Apple App store, Google Play for Android and BlackBerry Appworld respectively. 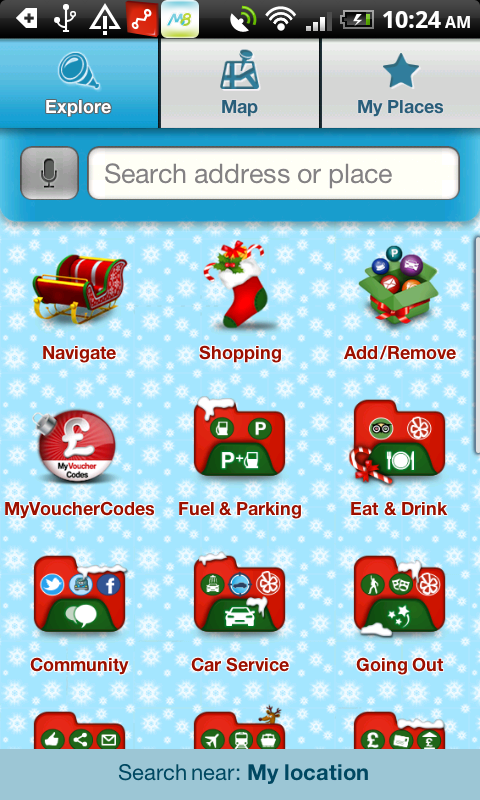 Special update alert: Local MyVoucherCodes.co.uk deals integrated into M8 for iPhone and Android! At M8 HQ, we’re always searching for ways to improve the experience of the lovely people using our app across the UK, and we know people want to know about the deals and offers relevant to them, as they go about their lives and explore new areas! With this in mind, we’re delighted to announce our partnership with multi-channel voucher and deals network extraordinaire, VouChaCha. What does this mean for users? Well, we can reveal that our M8 community are now able to access up-to-date offers on leading discount code site MyVoucherCodes.co.uk for the area they are in. Fantastic stuff! Enhancing the M8 experience even further by adding to our much-loved existing features including the integrated Lonely Planet, Trip Advisor and Yelp information and peer reviews, interactive Facebook and Twitter communication, and advanced navigation, satnav and mapping functions, we’re now connecting our iPhone and Android device M8 users with incredible vouchers from leading brands direct to their mobile devices, wherever they may be! Searching via categories of interest, our M8 community is able to access local deals currently active on MyVoucherCodes.co.uk. Extracting key details such as availability surrounding the offer – always read the smallprint folks(!) – M8 users can check out recommendations, directions and information from trusted sources using the app’s existing features and integrated social networks, before redeeming offers by presenting coupons direct from within the app. With an extensive range of vouchers available, M8 users can browse thousands of offers according to category – Eat & Drink, Shopping, Entertainment, Gifts & Flowers, Beauty & Health and Services – or find specific relevant deals using the search option. We believe that the simple in-app process will help our mobile app users find the best deals for them, wherever they are in the UK! Whether it’s a quick fix of flowers for a girlfriend, a trip to the cinema, an after work wash & blow dry before that big night out, or a tasty bite to eat that’s needed, M8 can help users find what they want, match them to any relevant offers, and get them there once they’ve made their decision without the faff of printing vouchers or scouring through multiple sources – handy! Join the conversation on Twitter – we’re @localM8 – and Facebook, let us know your thoughts, and feel free to brag about the deals you’ve found while using M8!